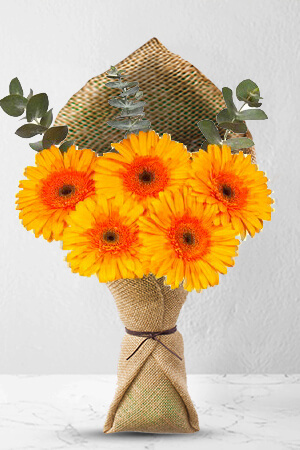 Send Merry, a vivacious and colourful bouquet of five orange Gerberas and Silver Dollar, to anyone who needs extra special good luck wishes, cheering up or just as little greeting a to say “I’m thinking of you”. Vase not included however we recommend a Standard Vase to perfectly complement these Merry Gerberas. Easy to use, always on time! Delivered on time and recipient loved the gift!